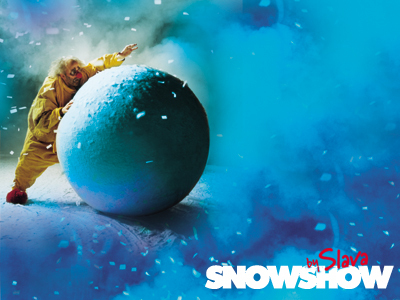 It has been renamed slavasnowball-1.jpg in an attempt to break the original link and to allow me to put a new, more interesting picture in place of slava’s snow ball. I went in to my Media gallery and tried to rename the jpg. Couldn’t find a way to do it so I just deleted the photo and re-uploaded it under the new name (slavasnowball-1.jpg). From there I edited my Slava post with the new jpg name so that MY links remain good. Then I TRIED, over and over and over and Over and OVER and OVERRRRRRRRRRRR again (only a WEE bit obsessed, remember?) to upload a new image using the old name slavasnowball.jpg. There appears to be a glitch, or perhaps a overwhelming force of evil, that prevents this from being allowed. Pure witchcraft, I tell you. WTF? Who is Journalgers and why are they taking my posts? 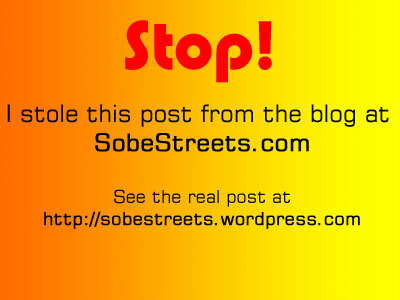 I just saw one of my posts on Technorati… on someone else’s blog. A place called Journalgers has copied my post about Slava’s Snow Show, but does not say that they took it from my site nor do they give a link back to my site. It looks like plagiarism to me. And I am pissed. I know there is a lot of theft on the Internet. I don’t care if “everyone does it”. It is still wrong. Crap like this really gets my goat. I just read at the New Times online that the Rock the Bells concert has moved from Bicentennial Park to Bayfront Park. All other details remain the same: same line up, same times, etc.. Forecasters expect temperatures to soar in South Florida when the Annual Miami Salsa Congress kicks off in Miami Beach on Wed July 30th. Prepare yourself for 5 days of more than 80 live showcases, workshops, dance instruction, cardio classes, pool parties, cocktail parties and some of the finest latino men to hit South Florida since, well last conference. A few tickets are still available from the Miami Salsa Congress website. Prices range from $75 – $255. The Miami Beach Resort and Spa will have daily workshops, evening parties and a vendor alley. The Fontainebleau Hotel will have daily pool parties, Morning Salsa cardio workshops and the Salsa Bootcamp. The Salsa Bootcamp for Beginners with Edie the Salsa Freak is on Sat and Sun from noon until 4pm. Tickets are $140 for both days. Rock the Bells concert in Bicentennial Park in Miami on Sat, Aug 2nd. 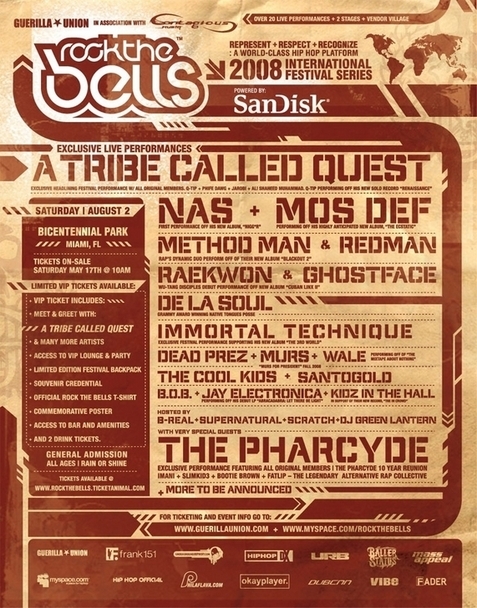 Concert featuring A Tribe Called Quest, Nas, Mos Def, Method Man & Redman, Raekwon & Ghostface, De la Soul, Immortal Technique, Dead Prez, Murs, Wale, The Cool Kids, Santogold, B.O.B., Jay Electronica, and Kids in the Hall. My god, I have no idea who any of these people are, but you go right ahead and have a good time. The show runs from noon to midnight. Bus Lines from Sobe to the show: M, S, C, and K.
Take the S or the C bus into downtown and exit at NE 11th St.
Take the K-Omni or the M into downtown and exit at NE 13th St at N Bayshore Drive. TalkNightlife forum members have an opportunity to win free tickets to the show. The 2nd bi-annual Urban Theatre and Entertainment Awards kicks off Tuesday July 29th at 8pm at the Hyatt Regency in Miami with a celebrity gala hosted by Melba Moore and JoMarie Peyton. The night begins with a parade of stars followed by the awards show, which promises to end with a bang. The Urban Theatre and Entertainment Awards celebrates the contributions of people of color and the nationwide achievements of urban theatre productions. Visit the Urban Theatre Awards website for the full schedule of workshops or to purchase tickets to the productions taking place through Saturday. They say it is a cross between Cirque du Soleil and Blue Man Group. Slava was the original Cirque’s clown genius. He is also the genius of this spectacle. I’m not really sure what to call it. Art in motion…comedy…musical production…snow storm… lots and lots of SNOW. Check out the YouTube clip to get an idea of what the show feels like and then call the Adrienne Arsht center for tix. Quickly. This show sold out in Buenos Aires, Mexico City, Barcelona, Madrid and London so expect tickets to sell out quickly here too. Tickets are $55. Show runs from July 24 – Aug 17. Show time is 8pm with Sat and Sun have a 2pm show.